PCI DSS and HIPAA are some of the largely applicable and followed standards from the plethora of information security standards. Comparatively, HIPAA is vague a standard than PCI which is somewhat more straight forward. But their focus is on completely two different kinds of data. For PCI, the “crown jewel” of data is the payment card information while for HIPAA it’s the individual’s health information wherein privacy is the main concern. Both HIPAA and PCI lays down penalty conditions in case of breach of data but it should be noted that HIPAA is a U.S government regulation while PCI is dictated by the Security Standards Council formed by five major payment brands. There are many common controls, which are later explained in this article that overlap these two standards and this should be looked upon as an advantage for organizations looking for complying both. From the cost perspective as well as execution of controls wise, it may seem lucrative to hit two birds in one stone! The rest of this article explains these two standards in brief, their comparison and overlapping requirements and benefits of combining both. Payment Card Industry Data Security Standard is one of the most granular and specific standard aiming towards securing credit and debit card related information. It applies to all entities involved in payment card processing – including merchants, processors, acquirers, issuers, and service providers, as well as all other entities that store, process or transmits cardholder data (CHD) and/or sensitive authentication data (SAD). PCI DSS is Industry regulation enforced by payment brands and has set 6 goals, broken into 12 requirements and more than 300 sub-requirements to be implemented within the cardholder data environment. HIPAA stands for ‘Health Insurance Portability and Accountability Act’. It is focused on protection of privacy of individually identifiable health information and gives patients an array of rights with respect to that information. It is applicable on Covered Entities (CE) and Business Associates (BA) which are generating, accessing, processing and transmitting PHI. HIPAA is a legal requirement, governed by the US government. The figure below shows the per capita cost for the consolidated sample by industry classification. Heavily regulated industries such as healthcare, financial, pharmaceuticals, transportation and communications had a per capita data breach cost substantially above the overall mean of $136. The HIPAA and HITECH Act set forth rules and penalties for healthcare organizations to secure their ePHI and become compliant. 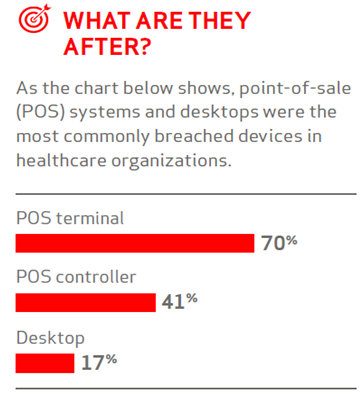 While majority of the healthcare practices accept credit and debit cards as payment, they often overlook the protection and security required for cardholder data. Hence it is equally important for organizations to secure ePHI and Cardholder data with utmost importance. Some significant trends from the ‘2013: Breach report: PHI’ by Redspin that draws our attention to the importance of protecting health information. Healthcare information being more sensitive and valuable is attacker’s most favored. According to the study conducted by Ponemon institute on Patient privacy and data security, it is noted that billing and insurance records and medical files are the most likely to be lost or stolen. 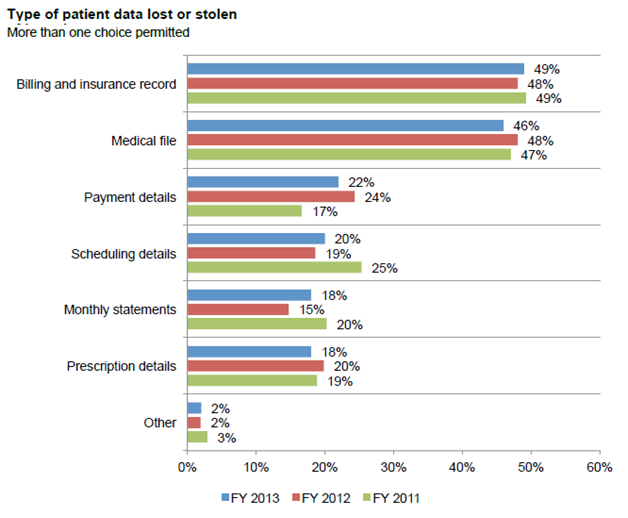 The graph below throws more light on the type of patient data lost or stolen. Combining HIPAA with PCI will help to secure the two most critical types of data i.e. PHI and account data. Hence in one go you can hit 2 birds with the same stone. There are many common controls in between these two standards, which will be reducing significant overhead and repetition if both the standards are implemented simultaneously. Designing the controls in a way such that they cater to the needs of both the standards will surely lessen reengineering effort and redundancy of controls. And all this in return will guarantee lesser audit cost and efforts! » Initially, identify the system components which are dealing with PHI and account data directly. » Understand the common infrastructure such as antivirus, log monitors, active directory, etc. supporting both standards requirements. Using PCI as a framework will not meet every auditable point on HIPAA compliance checklist. But, it’s a good approach and you will notice during the course of compliance that there are many similarities and meeting those becomes much simpler. Having complied with PCI does not mean that you are HIPAA compliant. Neither the reverse is true. Although they overlap, they remain as two distinct standards and should be treated as such. In order to meet compliance in the right way, OCR audit checklist should be followed for HIPAA and PCI DSS for PCI compliance. In the end, it’s not just about being compliant and flaunting a certificate, but, a more diverse approach with holistic security as an objective will pay in the long run.